Maestro Eduardo Cedeño and the Lake Norman Orchestra will return to Davesté Vineyards to celebrate Spring in the Vineyard! 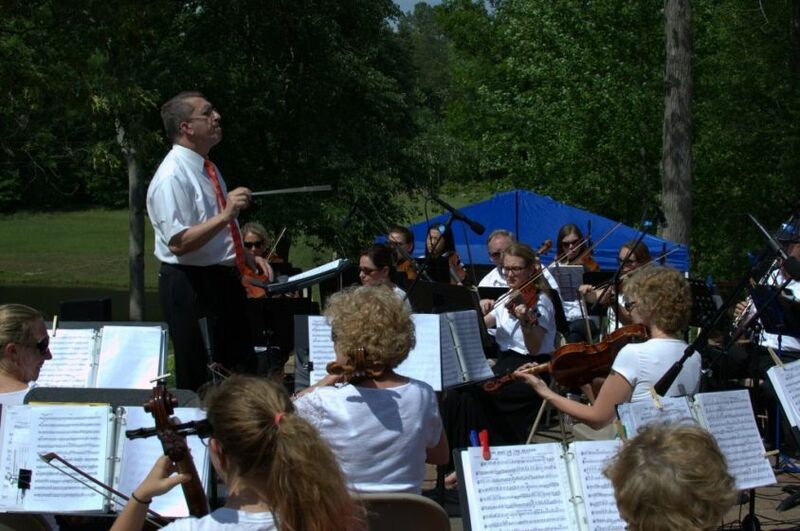 MOORESVILLE, N.C. - May 9, 2017 - PRLog -- Returning for a Spring celebration in Davesté Vineyards, the Lake Norman Orchestra will be performing an open-air concert with a wide variety of selections of easy listening music for all to enjoy in a casual, family-friendly atmosphere. Bring a lawn chair or your picnic blanket as the event is outdoors. A bistro dining area is available and seating areas fill up quickly. Pack your picnic basket, come relax and visit the wine tasting room, the art gallery and enjoy great music with your loved ones! Wine will be available for purchase by the glass or bottle (before, during and after the performance) … cash or credit. Craft Beer, soda and water will also be available for purchase. Please note: NCABC prohibits the transport of outside alcohol onto Davesté property; outside alcohol is not permitted. SATURDAY, May 20, 2017 4:00 - 6:00 P.M. Adults (21 and older): $10 cash at the gate. For adults (21 and over), your ticket includes one glass of wine with a Davesté Vineyard souvenir wine glass and a donation to the Lake Norman Orchestra's fundraising efforts. Ages 16-20: $5.00 cash at the gate - includes entertainment and donation only - no ticket issued. Ages 15 and under: Free Admission - no ticket issued. Maestro Eduardo Cedeño holds a Master's Degree in Music Theory from Butler University Jordan College of Music, Indianapolis with extensive music experience spanning the United States, Europe and South America. Cedeño studied conducting under the late Butler University Professor Emeritus Jackson Wiley and the Italian Maestro Ennio Nicotra. A founding member of the Simón Bolívar Symphony Orchestra, Director and Conductor of the Mérida Symphony Orchestra and Founding Member of the Coral Filarmónica de Caracas, Cedeño worked directly with acclaimed José Antonio Abreu. As a Founding Member of El Sistema, Cedeño continues to offer his time and talents to support its efforts in his community. Cedeño has collaborated with organizations such as the Philharmonic Orchestra of Indianapolis, Indianapolis Opera, Charlotte Civic Orchestra, UNCC Opera, Carolina Voices and orchestras in Venezuela. Cedeño is Music Director and Conductor of the Lake Norman Orchestra in Mooresville, Music Faculty at Mitchell Community College, Strings Instructor at Gaston School of the Arts, and Band/Orchestra Conductor at Langtree Charter Academy Upper School.